I'm all Tudored out this month!! I've completed my Tudor Rose pincushion design AND a new Henry VIII portrait mini cushion. 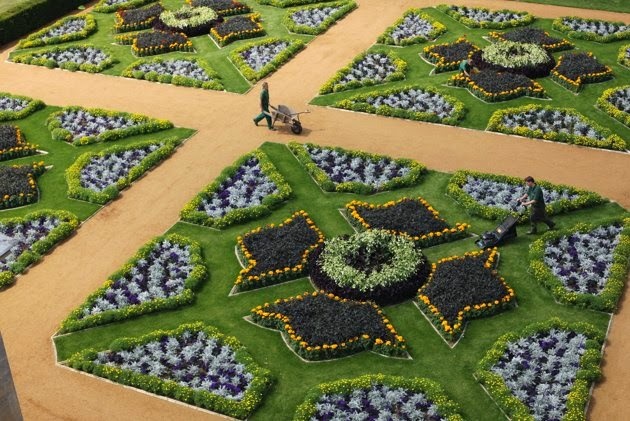 I was watching a programme on TV by Dan Cruickshank recently, called Majesty and Mortar and it featured the inside decoration of Hampton Court Palace - a home of Henry VIII. 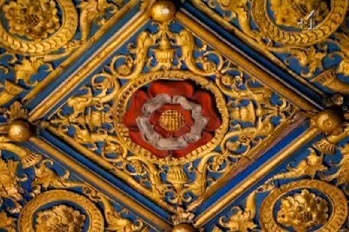 One scene showed a ceiling embellished with Tudor Roses against a turquoise background with gold filigree edging. Apparently this colour palette was favoured by the Tudor monarch and I just had to create my own version for my pincushion design. Although I have already produced a mini cushion kit featuring Henry VIII and his six wives the design didn't allow me to capture the opulence of the clothes and jewels of the period so I designed a new Henry VIII Portrait design along the lines of the Elizabeth I design. I had great fun working the glorious golds and rich reds into the design and I just had to use that deep turquoise shade that featured in the pincushion design as a background to Henry. When I'm stitching I don't like to work on large areas of one colour so I try to design in a way that will keep the stitcher interested, but not for them to get annoyed at keep having to change colours in their needle! It's a fine balance to get the colour usage right, but then that's the fun of designing. Here is Henry VIII in all his glory, standing next to Elizabeth I.
I do wonder whether to produce more designs along this style, featuring the six wives of Henry. But I also have an idea to produce a Queen Victoria design. Most pictures of this Queen are usually greyscale and dull, with her dressed in black so I would like to brighten that image and perhaps design her in a regal white/silver dress. Of course, Tudors enjoyed hunting so there is a tie-in with my next design here. I so enjoy working tartan-style patterns into cross stitch designs and for this design I wanted to get the feel of heathers and thistles blowing in the winds of the Highlands of Scotland so I used a palette of violets and mauves to create the tartan check pattern and gave the Stags a background of cold and misty blues and dusky greens. It made a nice change to use this type of palette in my designing after the rich golds and reds of Henry! 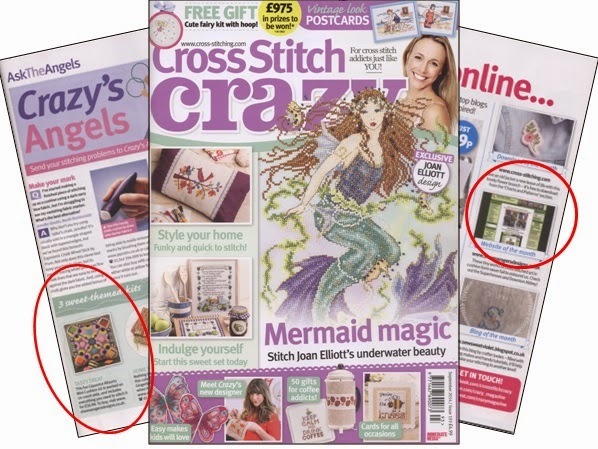 A mention must go to Cross Stitch Crazy magazine before I sign off this post as the kindly featured my Liquorice Allsorts kit in issue 193 (Sep2014) and also included my website as their Website of the Month. A big Thank You to them. My next task is to complete a new Halloween mini cushion. I've designed this one with a Zombie theme - so look out for the bloodshot eyeballs coming atcha! And I have a Clarice Cliff inspired design which is such an uplifting design to stitch with a variety of light and dark colours. My magazine commissioned projects should start appearing in a month's time - but I won't tempt fate by saying anymore yet, maybe in my next post....so I'll leave that to tease and tantalise until next time!